I've had the opportunity to take the new Air9 out for a couple of "get-to-know-you" trail rides over the past few days and as much as I hate to sound like an advertisement, the truth is Niner really knows their stuff when it comes to nailing mountain bike geometry. At least as far as when it comes to what I am looking for in a bike. Steve did an excellent job of matching my bike fit to the Rip, and we only had to make a couple of tiny saddle position adjustments to get my knee and hip correctly aligned. We set up the Air9 with the G2 fork I already had and bumped up the travel to 100 mm and the bike just rocks with that setup, plain and simple, and is seriously fun to ride! 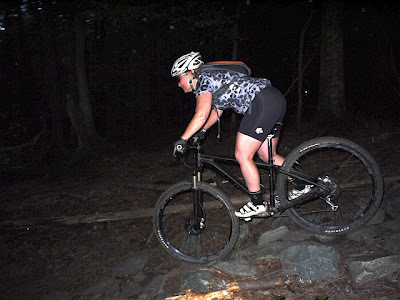 Once I got back into the zone of riding a hardtail again, i.e. standing up a bit more and letting my legs provide more of the suspension work, I didn't really even notice the rocks or roots.